On the eve of Thursday, December 1, I had one of those days. It started off with one of those nights where you knew you had to go to be early on account the next day was a big day, with lots of important things to do. Where you knew that from the minute you got up your heart would be racing in order to finish these important things which of course in retrospect aren’t that important but that’s another entirely different story. In this particular case, I had to organize my menagerie of doves, finches and one grey cat with white feet so I go see Elizabeth Taylor’s auction preview at Christie’s in New York, and be on a marketing panel that I had agreed to months ago. Problem was, that night was the night of the Santa Ana winds. For those of you in states that have “weather” let me tell you – in California, we’re not prepared for it – especially Southern California. These said winds started around 11pm and lasted to about 4am. The winds rocked our houses, uprooted full-grown trees, blew out windows, eliminated any hope for sleep and horrors shut off our electricity. No electricity meant – my cell phone started running out of juice halfway through the day, I couldn’t get to my car in the garage to drive to Home Depot to get some wood to nail down a blown out window or run a my thousand other errands and worst – I couldn’t get on my desk top computer to email my presentation for my talk onto my portable computer. What we did without electricity? While pondering this great thought, I heard the postman (rain or shine as you know) leave a nondescript cardboard shipping box at my doorstep. Upon opening it, I found an elegant luminescent gift box labeled World Famous Enstrom’s Milk Chocolate Almond Toffee – the kind of gift box that you would be perfectly at home on a table decked out with tea, cakes and white gloves. Each layer is carefully crafted from the pearly exterior to the carefully tissued interior that opens to reveal a heaping, generous layer of delectable, chocolate covered toffee. For toffee aficionados, toffee is the combination of all the things that are destined to prevent you from ever achieving that enviable six-pack - sorry Tony Horton. We’re talking about sweet cream butter, sugar, salt and of course chocolate and crushed almonds and honestly if that’s what we’re talking about – who cares about that six pack – right? But what makes this toffee extra special is that their recipe which was perfected by Chet Enstrom three generations ago. 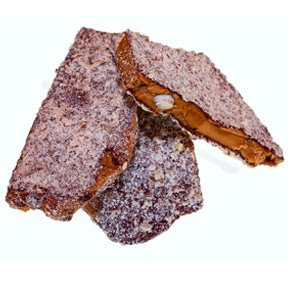 The result is a rich, crispy, buttery, silky and salty toffee that is coated with milky chocolate creamy goodness and liberally dotted and sprinkled with toasted, crushed almonds. Each bite feel joyous and the joy doesn't have to end there my friends. 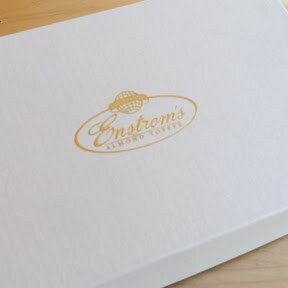 Enstrom also carries a Dark Chocolate Almond Toffee, Gourmet Chocolates, Turtles and Truffles as well - so you can satisfy your sweet tooth in a myriad of ways. 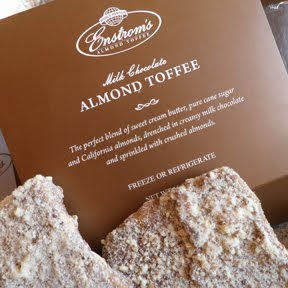 After savoring a luxurious piece – OK more than one piece - like a proverbial rainbow - Enstrom's made my day turn around. My neighbors who could get into their garage, came by boarded up my broken window, friends brought over dove food and took me and my computer to a power source - and throughout we broke toffee together. And, the day turned around - such is the power of Enstrom’s World Famous Milk Chocolate Almond Toffee and the power of friends.